That is (now: was) the situation before the following steps. And I can tell you that even a Linux OS doesn't like the lack of space on the system drive at all. Although, I think it is not necessary to stress the fact that you should (read: have to) backup your data and drives always. Just to be on the safe side, and to revert back to the original state easily and quickly. First, shut down your virtual machine. Even though it is possible to run almost all of the following in a running environment I doubt that for the casual (home) administrator reading this article it might not be necessary to risk your data. Okay next, it would be necessary to expand the size of virtual hard disk, and then afterwards extend the logical volume with the newly created partition. After successful expansion it is about time to check our disk modifications in the settings of the virtual machine. Launch the Oracle VM VirtualBox Manager, select your virtual machine and either press the Settings button in the toolbar or choose from the menu Machine -- Settings (Ctrl+S). 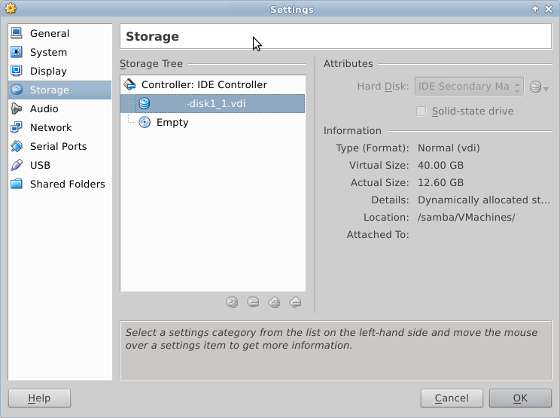 Next, select the Storage entry from the side pane and then the virtual hard disk that we just modified. You should see something similar to the following screenshot. In case that you had to convert an VMDK drive to VDI, please select the newly cloned drive from the dropdown list in the Attributes area. You should have the .VDI disk attached to your virtual machine. The above mentioned conversion is not necessary in case that you have an installation of VMware Player or even VMware Workstation at hand. In my case, I didn't. 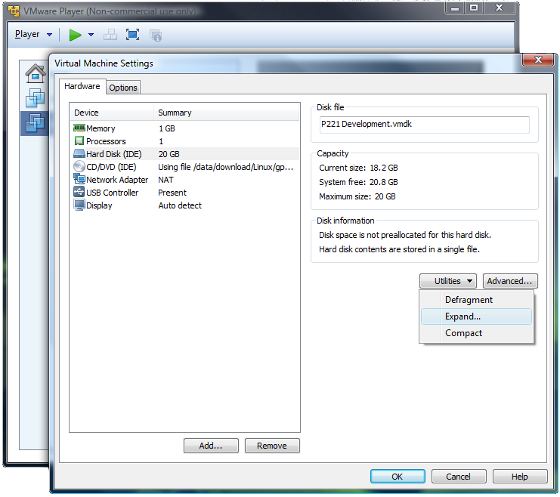 Anyway, VMware Player gives you the ability to expand the disk capacity through the UI directly. Open the Virtual Machine Settings, then select the Hard Disk from the list of devices and below the Disk information you'll have a list of utilities in the dropdown list. Choose "Expand..." in order to change the disk's capacity. That's all for the 'physical' expansion of our hard drive. Now, start your virtual machine as we are going to take of the software part. This will give us an overview of the existing partitions. The new disk size has been accepted already and it's now time to create a new partition. This article is not about how to use fdisk on the command line. There are other tutorials with more detailed information about the particular steps, and you might have a look at the manual page of fdisk directly. To create a new partition we launch fdisk on our hard drive. Of course, this might vary depending on your existing partition table. Please, adapt your inputs accordingly. During my research in preparation of this 'surgery' I also came across a couple of resources online where it is stated that it is also possible to enlarge an existing partition to the full extend of the new capacity of the disk drive. The general recommendation is to use a more sophisticated partitioning tool like the freely available GParted. While using a Windows operating system, I clearly would recommend this approach, too. Mainly because it's your system drive that runs out of space and Windows is hardly capable to span over multiple drives (at least in casual environments like home and office desktops). I already did this in the past to enlarge a Windows Server 2008 R2 system, and it went as smooth as expected. You can download the GParted LiveCD ISO here. Once you understood the necessary steps to extend an existing logical volume it's fairly easy to reproduce. The general concept is well documented in Chapter 4 of the LVM Administrator's Guide for CentOS, and is based on the following procedure. First, you create a physical volume (PV) based on your new partition which is then extended into an existing volume group (VG), and then finally extended into a logical volume (LV) within a volume group. After resizing the logical volume you are ready to go and the new disk space is available in your system. This will prepare the partition for use in a volume group. Note: Depending on whether you are going to extend your system with an additional partition or a whole drive, you might even skip the partitioning and create a physical volume using the whole hard disk. Done. Next step is to assign the available space to the logical volume that we would like to expand. In my case, I'm going to extend the first logical volume with the new physical volume. Almost done. After expanding the volume group and the logical volume we only have to populate the information about the new total size of our logical volume. Okay, my system has now more than triple the original disk size. Let's see how many years it is going to run before I might have to add another partition to the logical volume. Once you understood the necessary steps on how to expand a logical volume it's actually very simple to reproduce. You start with the physical preparation of the hard disk, either by adding a new drive or by expanding an existing virtual drive. Then you create a partition of type 8e - Linux LVM - for that new unallocated drive space. And to complete the procedure you have to walk through the LVM handling by creating the physical volume, extending the volume group and finally extending and resizing the logical volume in that volume group. Even in case of an error it's relatively simple to track down the root cause and take care of it. As mentioned earlier I got stuck in the process because of two issues. First, my Linux operating system, here CentOS 5.3, didn't get the new partition table automatically. So when I run the following command I got the response that the specified device isn't available. Device /dev/hdc3 not found (or ignored by filtering). And second, I mistyped the name of the logical volume - LogVol01 instead of LogVol00 - and added the new partition to the swap area. Well, following are some details on how to detect that kind of issue and how to remove a physical drive from a logical volume and volume group. That's kind of bummer. Especially, so close to the finish line. Well, it turned out that volume group had two logical volumes LogVol00 and LogVol01. And the second one is actually used for the swap area. Which easily explains why there is absolutely no valid filesystem superblock to be found - no matter how hard I would try it. First, I thought that it might have been a problem with the filesystem type, as I am using ext2, ext3, ext4, and xfs interchangeable. But a quick check confirmed that I'm using the right command. In case of xfs you might have to work with xfs_grow command instead of resize2fs. As usual, follow administrator's rule number 1: Don't Panic! Have a look at the history of your inputs, here your commands on the console, and check them entirely with the outputs of the various display commands - pvdisplay to show information about physical volumes, vgdisplay for details about volume groups, and finally lvdisplay to get an overview of your logical volumes. Good luck with your mission and leave your comments below. Our meetup this month is themed towards WordPress. Some say it is one of the best content management systems in the world... Well, have a look for yourself.